Back in April of last year, I had to go to Rockford where my company’s home office is for some office-wide training. That was pretty standard stuff, but also only lasted half of the day. They let everyone go home afterwards, which was fantastic. Since my home was over an hour away, I planned in advance to kill some time at a local card shop before heading back. At this point, unfortunately, I don’t think it’s even worth mentioning the name of the shop as it’s since closed down for good. I learned that when I tried looking up their hours for a repeat visit recently. Their advertised last day was a couple days before I was scheduled to be in town with time on my hands. That’s too bad. The owner also sets up at the nearby mall for their regular card shows (or at least did in the past, and I think he helped organize them). Those shows are kind of tiny, but were fun to browse the couple times I’ve been able to go. I spent probably close to two hours or so in that card shop on this first and last visit. It was a big place and I did want to go back to look for more. Most of the space was memorabilia and supplies that I didn’t care for. But I gravitated towards the ten-to-fifty cent boxes and loaded up heavily, mostly on the dime side. 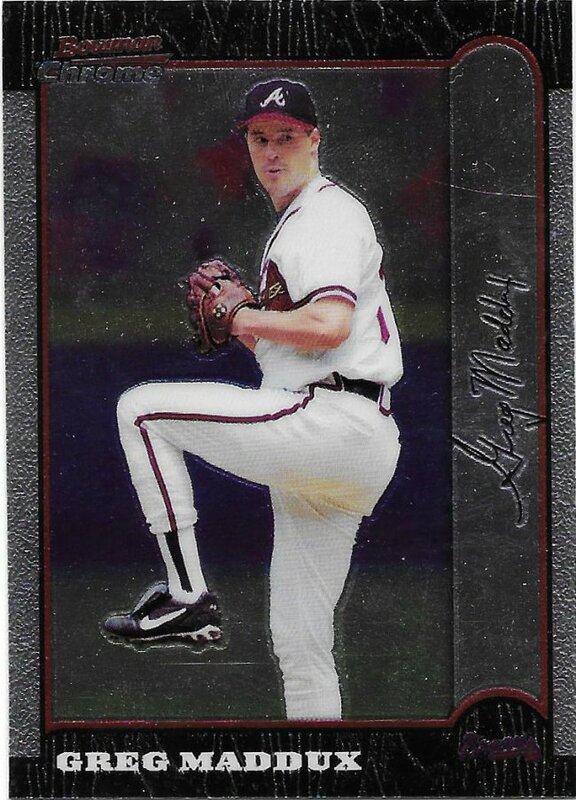 After I was done with that, I picked up quite a few Kerry Wood relics from the case, but I’ll show those another time. For the time being, I’ll simply showcase a tiny portion of those cheapy deals. Same goes for the next few. 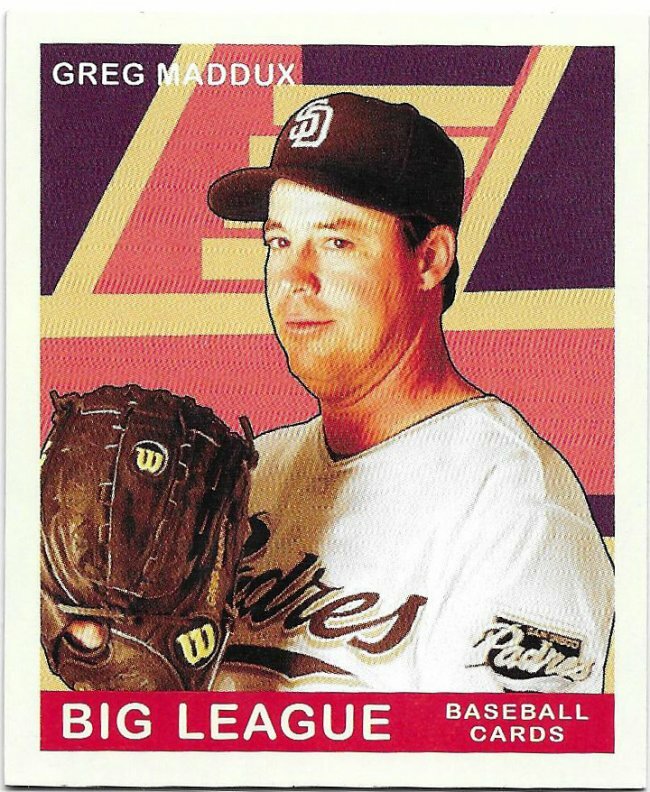 I didn’t find a lot of Maddux cards that I needed, but I’ll snag an old Bowman Chrome. I don’t like Bowman’s Best, but I like the price. Crazy that I didn’t have this yet. Sweet Spot is a high end thing, so it’ll be more rare for a fellow card blogger to have one of these to trade me. Love the red foil. 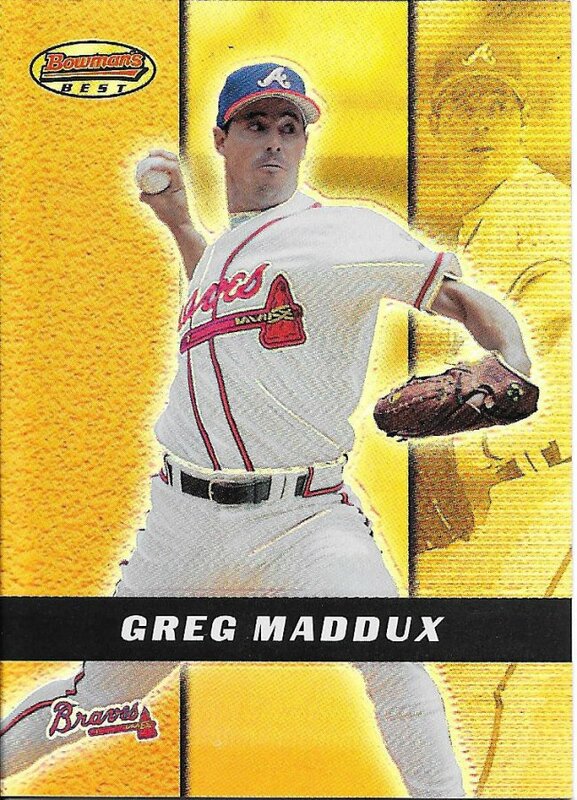 A small end to the Maddux portion of my haul. Yep, this was it for him, but I’m cool with that. A gaudy Goudey to move on to some of the main attraction. I’m currently writing this with thunder storms passing through the area. Let’s hope for no actual power surges. 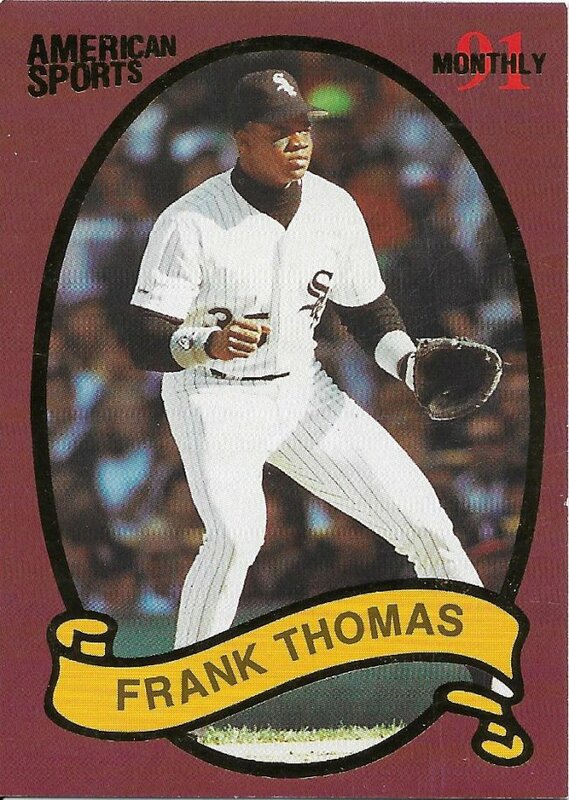 I’m not sure who had the most unlicensed cards made, but Frank Thomas has to be in top 5 for baseball, if not top 3. Look at that foil! Look at that meteor that’s gonna get smacked away from our precious planet! 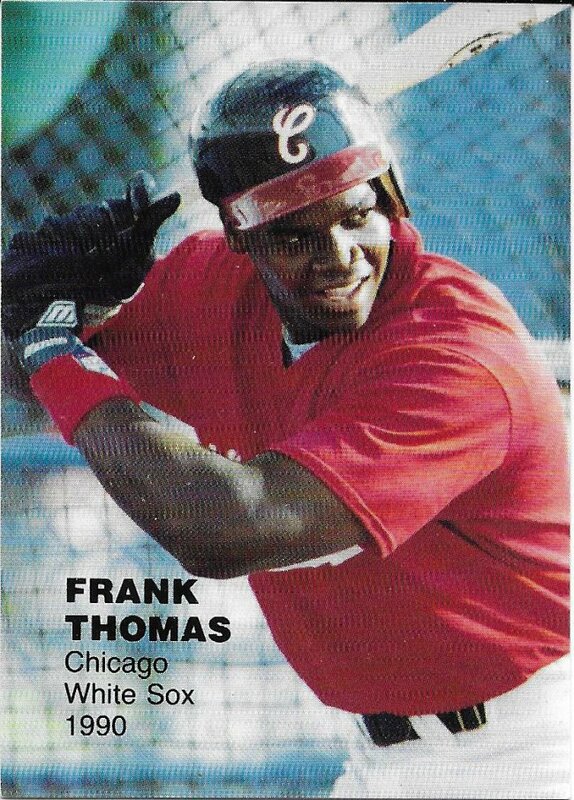 By now you’ve probably guessed that most of my stack was Frank Thomas oddballs and unlicensed stuff. Makes sense they would end up in a mostly local shop, and of course I’m going to pile up when they price is right. 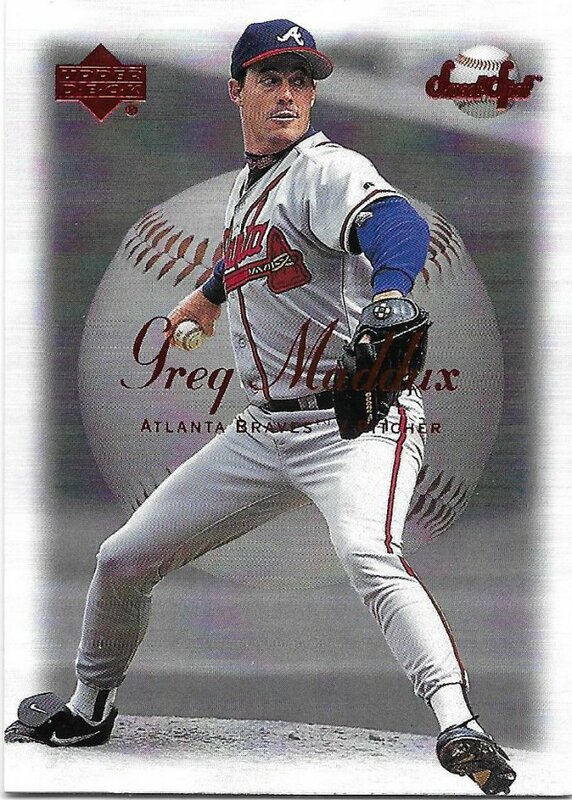 Several were from this American Sports Monthly thing, and they’re not terrible looking cards. 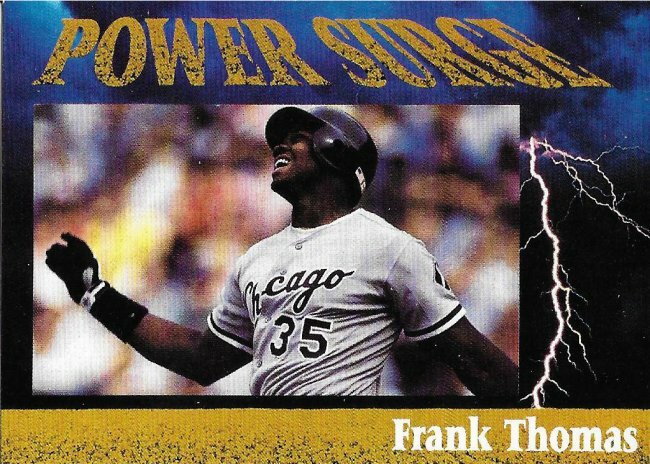 I’m not too familiar with that institution or how these were distributed, but it went on for a while with several different designs and Frank was heavily featured. You’ll see a lot more later. 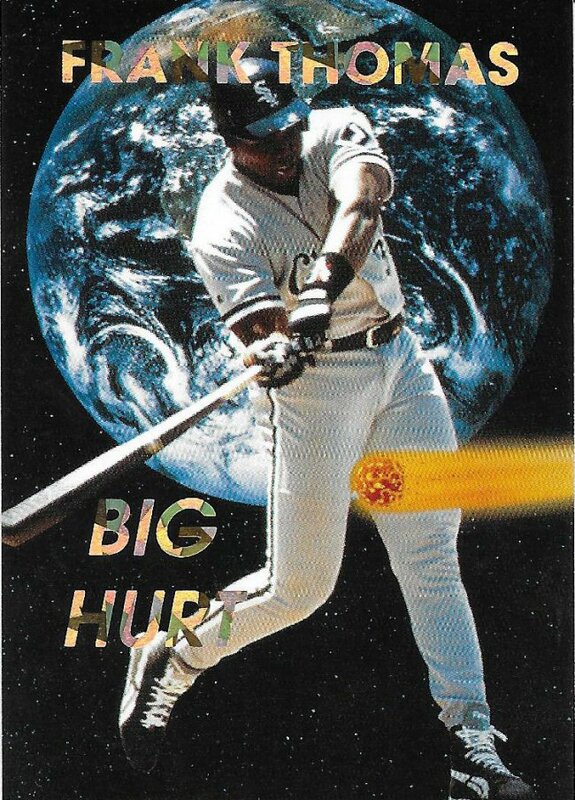 Overall, I have a couple dozen more cards of the Big Hurt that look equally awesome and not-major-company quality. The toughest part is identifying them, and checklisting them, but maybe I’ll save that discussion for another day. Too bad I can’t go back to that shop another day. 35 left to show before taking Sportlots delivery. Broders and magazine cards. I miss the good old days of card collecting. I do, too. 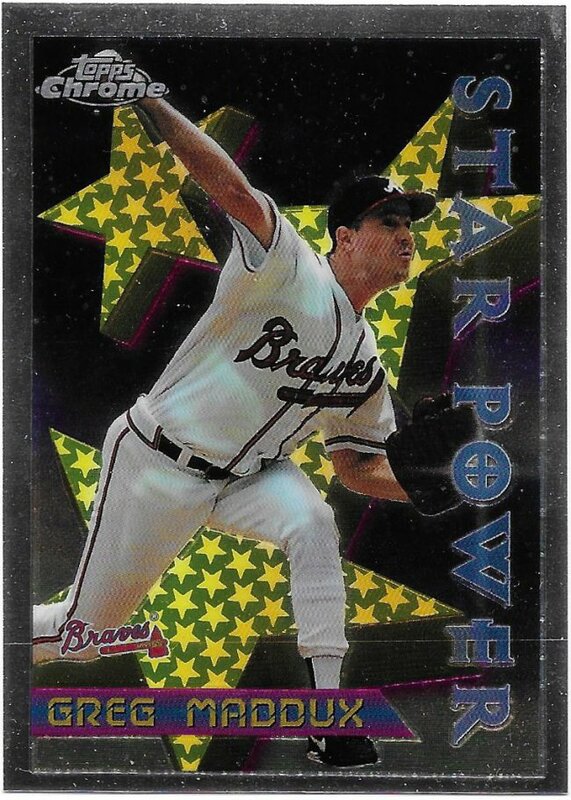 I miss the campy creativity of the unlicensed card makers. Now they just rip off old Topps designs or straight up reprint cards. Where’s Mike Trout hitting a meteor?